For such a common word, strategy is often misunderstood, misinterpreted, and misapplied. Given the complex challenges facing organizations – and entire societies – we must grow more and better strategists. What is strategy, and why aren’t more leaders better strategists? While strategy is as foundational as DNA within the most exemplary companies, why are so many organizations missing it altogether? How can I apply strategy in palpable, pragmatic ways to the benefit of those around me? As a result of demonstrating a more Strategic Mind, leaders will employ a robust language and methodology for crafting, communicating, and implementing strategic aspirations and commitments. Contemporary business is screaming for equally creative and critical thinkers capable of leading teams and entire organizations. 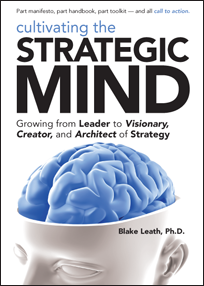 Blake Leath’s breezy writing style, intuitive models, research-based solutions, and sticky storytelling make Cultivating the Strategic Mind a stimulating, fun, and immensely credible approach toward developing strategists for our evolving world of work. If you believe in the fundamental importance of thinking as a differentiating competency for exemplary leaders, it’s time you treat yourself to the book you’ll want to share with your colleagues – the one written with you in mind and designed to guide leaders on the journey to visionary, creator, and architect of strategy.